NBC has released the synopsis for the third episode of Brooklyn Nine-Nine's upcoming season, "The Tattler", which will air Thursday, January 24. The Tattler - 01/24/2019 (09:00PM - 09:30PM) (Thursday) : Jake and Gina attend their 20th high school reunion. Back at the Nine-Nine, Charles helps Rosa with her love life. Brooklyn Nine-Nine returns this Thursday, January 10 for its sixth season premiere, "Honeymoon", at 9/8c on NBC. NBC has released the synopsis for the January 17 episode of Brooklyn Nine-Nine's upcoming sixth season. Hitchcock & Scully - 01/17/2019 (09:00PM - 09:30PM) (Thursday): Jake and Charles investigate a case of Hitchcock and Scully from the 1980s. Meanwhile, Amy's uniformed officers and Terry's detectives fight over limited resources. Brooklyn Nine-Nine returns next Thursday, January 10 with its sixth season premiere, "Honeymoon". NBC has released the synopsis for the upcoming sixth season premiere of Brooklyn Nine-Nine. Honeymoon - 01/10/2019 (09:00PM - 09:30PM) (Thursday): Jake and Amy go on their Honeymoon. Capt. Holt finds out whether he is the new commissioner of the NYPD. 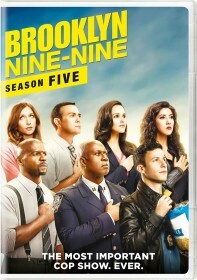 NBC revived Brooklyn Nine-Nine last year when it was cancelled by the FOX network after five seasons. NBC, whose sister studio Universal produces the show, ordered eighteen episodes to air in mid-season. Andy Samberg has been nominated in the Best Actor in a Comedy Series category at the 2019 Critics' Choice Awards, it was revealed today. The other nominees in the category are Hank Azaria (Brockmire), Ted Danson (The Good Place), Michael Douglas (The Kominsky Method), Donald Glover (Atlanta), Bill Hader (Barry) and Jim Parsons (The Big Bang Theory). The 24th Critics' Choice Awards will be broadcast live on The CW on Sunday, January 13, 2019 at 7p.m.